Women & Children First's Used Book Sale is an annual tradition benefiting The Women's Voices Fund, the non-profit arm of the store that supports all of our programming and events. Our annual used book sale (part of Andersonville's Sidewalk Sale weekend) will be taking place Saturday, July 28 - Sunday, July 29th. Book lovers and bargain hunters won't want to miss this opportunity to treasure hunt through the stacks for great deals on fiction, nonfiction, children's books, and LGBTQ titles; all priced to sell. This year, we'll be accepting donations on Mondays, Wendesdays, and Fridays beginning Monday, June 11th through July 25th. 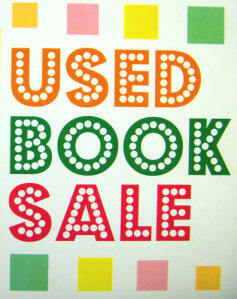 Donated books should be in sale-able condition. We will NOT accept reference books, mass market books (pulp paperbacks of a lower quality, usually around 6" x 4" in size), DVDS, or foreign language books. Any books that do not meet our criteria will be returned to you at the time of donation. Interested in volunteering for our Used Book Sale on either July 28 and/or 29th? Please email Sarah at wcfsarah@gmail.com. Volunteers will work 3 to 4 hour shifts and, in exchange, receive credits to redeem for free books! Please note that volunteers will be expected to lift 30 lbs. Also, this is traditionally one of the hottest weekends of the year so volunteers should be prepared for the heat. We will provide water and sunscreen.